When Cindy Garloch was approached by Travis Dennison to charter a Toastmasters club in Zionsville, the pair realized it was a no-brainer. 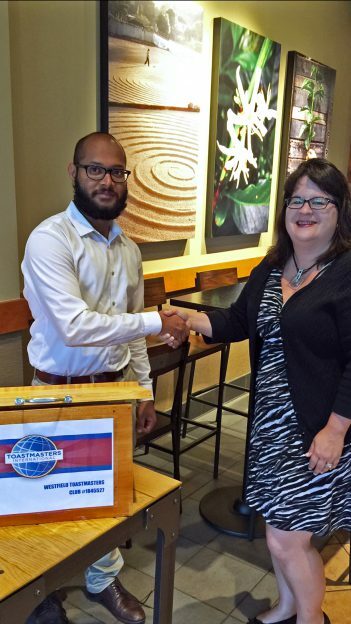 Toastmasters International is a nonprofit which teaches public speaking and leadership skills. Garloch said the clubs have recently evolved to include 10 different pathways a member can go down. Pathways include dynamic leadership, effective coaching, innovative planning, motivational strategies and more. Dennison was a member of the Westfield Toastmasters, but he lived in Zionsville. A club requires 20 members to charter, and currently there have been approximately 10 attending the Zionsville meetings. Once chartered, Garloch will leave the Westfield club and join the Zionsville club. The Zionsville Toastmasters meet every Thursday from 7 to 8 p.m. at Zionsville Town Hall, 1100 W. Oak St., in room 205. Those interested can attend a meeting or reach out to Dennison at dennisontravis@gmail.com.